This Nativity is made by a disabled young man named Anayet Hossain in Mymensingh, Bangladesh. 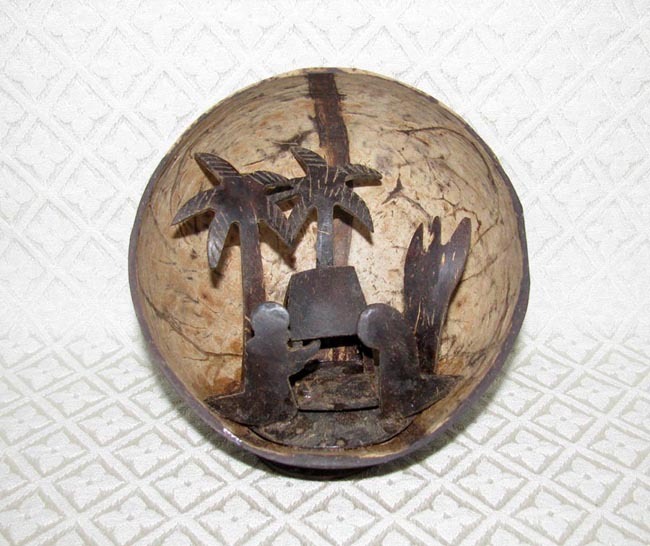 He carves figures from coconut shells and then assembles the figures inside a coconut shell. The scene includes the Holy Family in front of a stable, plus three tropical trees in the background. The shell measures approximately 4.5 inches in diameter. Anayet had a high fever when he was 2 years old that caused his legs to swell. Then his legs became weak and thinner so that eventually he could not stand or walk. He learned to make crafts from a small organization in rural Mymensingh that supports people with disabilities. Since 1997 this organization has helped people make crafts to earn income and they gave Anayet a wheelchair. Working with coconut shells enables Anayet to support his family.